iRobot hasn’t changed the basic formula of its Roomba robot vacuums since the product line was first launched in 2002, but each new generation brings small improvements that make using the bots a little bit easier. The newest Roomba i7+ has two key changes: the robot now remembers your home’s floor plan, and it empties itself. The auto-emptying feature is probably the most useful. The i7+ doesn’t actually fling dirt into your garbage after each clean; instead, it uses a hopper attached to its charging station as an intermediary. Each time it returns to the base, dirt in the robot is sucked up into the hopper, which stores up to 30 bins. Other robot vacuum makers have offered this option for years, but it’s good to see iRobot introducing it as well. The company says the bin is big enough that you’ll only have to empty it every couple of weeks. Hopefully its vacuum system isn’t prone to clogging. The i7+ also builds on the room-mapping functionality introduced with the Roomba 900 series. This tracks the layout of your house to help the robot cover as much ground as efficiently as possible, creating a basic map of each room using a combination of odometry (measuring how far the Roomba’s wheels have turned) and a low-res camera (which recognizes patterns of light and dark created by furniture and walls). Some customers will be understandably uncomfortable about their vacuum cleaner storing a map of their home, (“Honey, why has the Roomba marked ‘valuables’ on this map of the bedroom?”). And, indeed, a copy of the map does go into the cloud via your home Wi-Fi, although the images taken by the low-res camera stay on the Roomba itself. iRobot is aware of these concerns, and says securing this information is a top priority — and the data may also have other uses. 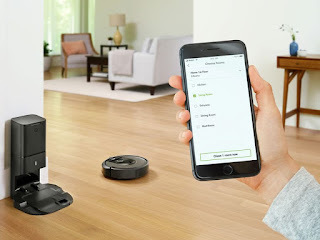 Speaking to The Verge earlier this year, iRobot CEO Colin Angle said your floor plan could, in the future, be shared with other devices in your home, letting you control your IoT lights room by room using your voice, for example. Angle stressed that this sort of data sharing would only be done with users’ permission and that mapping data would never be sold to third parties. And for customers who just don’t like the idea of having their homes mapped, iRobot is also launching a cheaper Roomba, the e5. This doesn’t have any of the self-emptying or room-mapping features of the i7+, but can still be controlled by Wi-Fi or digital assistant. Both the i7+ and e5 also have new rubber brushes designed to work on carpets and hard floors, which iRobot says get tangled far less frequently than brushes with bristles. As ever with Roombas, price will be an issue for many, especially considering that robot vacuums can’t hit every spot in your house, and you’ll almost certainly need another Hoover. The Roomba i7+ and the base station cost $949, with bags for the hopper priced at three for $14.99. The i7+ by itself costs $699 and the base station can be bought separately for $299. The Roomba e5, meanwhile, will cost $449. In both cases, it’s a steep price to pay for convenience, but worth it for some. The iRobot Roomba i7+ will go on sale in “certain international markets” in Q1 2019, while the e5 will be available at irobot.com in the US and Canada from next Tuesday.